When you’re stuck in an airport, you’re a captive market. Whether or not you can find something you truly want to eat, they see you coming. I have to blame Richard Branson for making me eat that slice of pizza at the airport in Charlotte, NC, yesterday. A few years ago, I attempted to provide a unique food offering at Heathrow Airport – Kosher hot dogs dispensed from a vending machine. For some reason, only known to BAA (the airport operator), they didn’t want the money I was willing to pay to make it happen. Orthodox Jews are S.O.L. when it comes to buying food in most airports, and as soon as I read about the Kosher hot dog vending machine, I thought my ship had come in. Turned out I couldn’t get BAA to see it the same way. Anyway, Branson and the pizza. It was already a week late and I knew that I HAD to get my mailing campaign out yesterday. No ifs, no buts. Everything else could wait. The thing was, I also had to get to the airport an hour away for my 3.50pm flight to get me on the way to New Orleans, via Charlotte, NC. It turns out that when you’re driving into the sun and wearing polarized sunglasses, the glint off every car in the mirror is blue – and looks just like the strobe lights that the police have fitted to their cars here. My heart was pounding the entire drive from Myrtle Beach to Wilmington. I wanted to make the flight, but I couldn’t afford to be pulled over for breaking the speed limit. Driving along Highway 17, there was this crazy-assed black Dodge driver behind me. He was right up on my rear bumper while I was being pretty sensible in the left lane. He’s pulling out to the right, ducking in slightly to left. He wanted me to move. But where was he going to go? There was no progress to be made ahead of me. I pulled into the right lane and he raced in front and pulled over the pickup truck ahead of me. He was P.D.! Another unmarked P.D. vehicle pulled in front of me and slowed to a stop across my lane. I gave them enough time to flag me down if they wanted me as well, but they were BOTH tagging that pickup truck. For the rest of the drive to the airport, I realized that unless it was a truly substantial price difference, it wasn’t worth the hour and a half of stressing about whether I’d make the flight. Time really is money, and sometimes it’s better to pay more and have the extra time. I was stressing because everyone – and I mean everyone told me the drive to the airport would take me an hour. The GPS on my phone said 90 minutes. And it really did take 90 minutes. Everyone was wrong. Sir Richard Branson was one the people I have written to with an exclusive invitation. You may also be one of the recipients of that invitation, so keep an eye out. It could be dropping into your mailbox any day now. 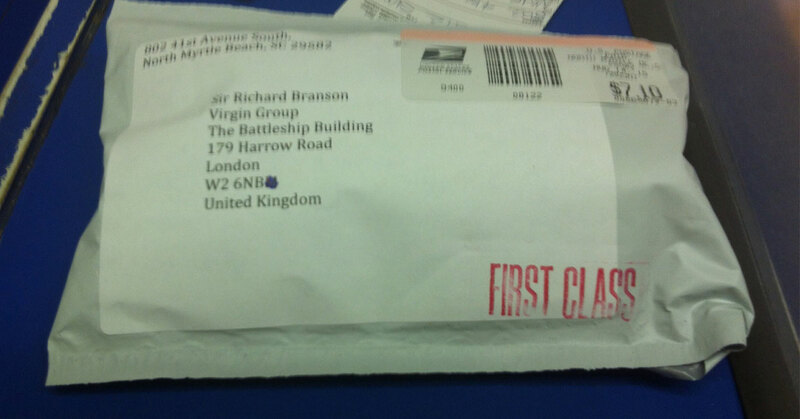 Branson’s mailer kept me at the Post Office because of the international shipping and the customs form. It made my timing really tight – too tight to eat anything before I got on the plane. By the time I was in Charlotte, my headache wouldn’t go away. It was part stress-buildup and part lack of blood sugar. I was looking forward to a slap-up dinner in New Orleans, but I knew I had to eat something. And I didn’t want to have to buy Aloe Vera for the rash on my behind from buying airport food. Nor did I want anything heavy and ruin my appetite. So a $5 slice of pizza it was going to be. It wasn’t great pizza. But it brought me back. And for having to eat that pizza, I blame Sir Richard Branson. It got me thinking. When I get home, I should set up pizza-by-the-slice at Heathrow Airport. In Charlotte they were killing it! Captive market. They were lining up for a five-dollar slice of pizza. They must have been taking $100 every 5 minutes. I know that airport retail space is expensive, but pizza has the highest margins of any food operation. If you can’t make 5-a-slice pizza work in an airport, then you don’t deserve to be in business. Maybe someone will go and start pizza-by-the-slice at Heathrow before I get home. Maybe that’s you! Good luck to you if you do. I think it’s a great idea. In the mean time, keep an eye on your mailbox. I’m off to enjoy New Orleans. That was a very entertaining blog post! Thanks for sharing that ride with us Simon! It was a fun one! LOL! 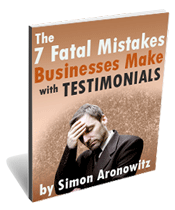 Great blog post Simon! What you really need to open at Heathrow Airport is a Kosher pizza by the slice food operation – then you can charge even more per slice! However, while I can charge more for it being Kosher, I’ll have to pay for a Mashgiach, pay more for all the ingredients, and then not be able to have a lot of the meats that non-Orthodox Jewish folk like to eat – like pepperoni, ham, spicy beef, spicy chicken, bacon etc. That’s why the hot dog vending machine would have been perfect – it was certified Kosher and did only one thing: produce Kosher hot dogs.